While chicken nuggets are a delicious, simple and quintessentially American food item, they are not exactly the most nutritionally fulfilling. If you plan on serving chicken nuggets as an entree, either as lunch children or dinner, especially to appease some small children, you need to supplement them with some complementary side dishes. 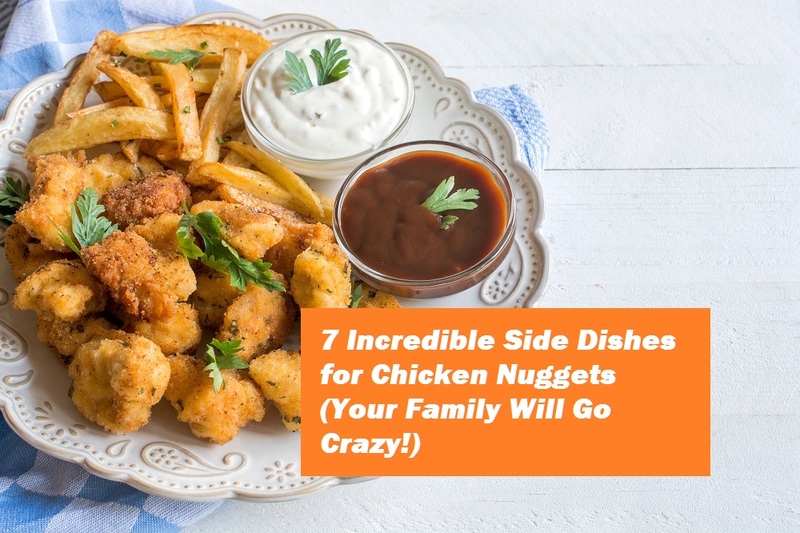 This article will highlight several possible ideas to serve as sides with your chicken nuggets, all of which feature complementary nutritional benefits in order to provide a meal that offers a balanced flavor profile and that has more to offer than protein and sodium. One of the main issues when it comes to thinking up side dishes to serve with chicken nuggets is quantity; how many people do you intend to serve? While some of these side items are better suited to serving a large crowd of people, all of them are suitable for a family meal. Easily one of the most common pairings with chicken nuggets, french fries provide a healthy amount of starch, can be prepared quickly and in large numbers. If your chicken nuggets need to be baked in the oven, you can even be more efficient by frying up your fries while the nuggets bake to a golden brown. Another benefit of serving fries with nuggets is that no one really needs any silverware, making them is a great idea for anyone looking to let her small children eat the same food as the rest of the family. 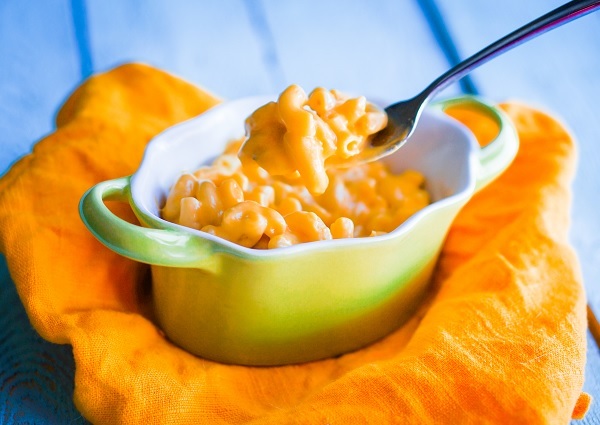 This is another starchy suggestion that also allows you to incorporate cheese, a food that everyone other than the lactose-intolerant can appreciate, into your meal plans. Depending on how you go about things, you may even want to consider making this cheesy pasta part of the entree by mixing the nuggets in with the pasta and serving the whole mess in one go. Yet another starchy, classic side suggestion is to serve your nuggets with mashed potatoes. Because its such an easy thing to make, mashed potatoes afford you a great deal of flexibility in how you go about preparing them; you can easily add butter, garlic, and even offer gravy with them. If you decide to use gravy with your mashed potatoes, some people may even appreciate the option of using the gravy as a dipping sauce for their chicken nuggets. This is another fine suggestion for serving with chicken nuggets, as well as the first on this list without a noticeable amount of starch. Steamed vegetables are a great way of eating healthy and you have a great deal of variety when it comes to deciding which veggies to plate. While a classic would be a mixture of green beans, carrots and corn, you could pivot into a completely different direction by offering a Southern staple like fried okra and cooked collard greens. While chicken nuggets are commonly breaded, you can still get some nutrition and fiber into your guest’s diet by serving them with a whole wheat roll. When you are feeling particularly fancy, you may want to slip in a slice of cheese, preferably of a kind that is known for easily melting, such as fontina, provolone or even mozzarella, all of which were cited in a study by the University of Wisconsin-Madison. Barring any personal touches from making them from scratch, chicken nuggets are relatively mild in flavor. Give your meal some extra kick by it with chili, eschewing the meat to give more attention to the nuggets. Rice can be as simple or as complex as you want to make it, though we advise against going with just some bland plain rice unless you are trying to keep things healthier. Consider adding butter or seasonings to your rice as you cook it, possibly even pairing it up with some steamed vegetables as discussed in the previous subsection. White rice, half a cup per serving. Water, 1 cup per half cup of rice. Butter or margarine, half a tablespoon per serving plus enough to coat your pan. Cooking oil, whichever kind you prefer. Barbecue sauce, whichever kind you prefer to cook with. Optional: Preferred seasonings in your rice. Make sure to not go overboard and use the same seasonings and spices that are present in your chosen barbecue sauce. A pot or rice cooker. A large spoon, preferably wooden. A lidded bowl suitable for keeping food in the fridge. Refrigerator. 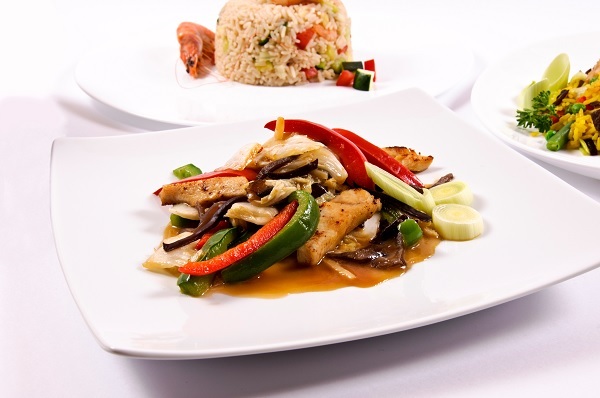 While not necessary, it is strongly recommended for the last step of the dish’s first phase. A serving vessel, either a large plate or bowl. Prep Time: 16-24 minutes for the rice plus several hours in the refrigerator. Total Cooking Time: 90 seconds for every two cups of cooked rice. Add the rice, water and butter or margarine, plus any seasonings you prefer, using the given ratios for water, rice and butter. Note: If you want less starchy rice, rinse the starch off your rice prior to cooking it and reduce the amount of water to 3/4 cup per serving. Stir the mixture once in order to fully submerge the rice. Allow the rice to cook, starting at 16 minutes and adding a minute or so for each serving beyond one person. Fluff the fully-cooked rice with a fork. Let the rice cool for several minutes, then transfer it to your lidded bowl. Waiting diminishes moisture trapped within the bowl. Refrigerate your bowl of cooked rice for several hours. While you could immediately use the rice for stir-fry, it will likely contain a good amount of moisture that could ruin the meal. 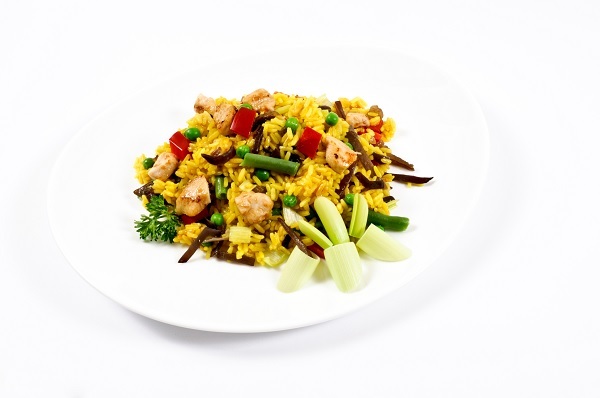 Once your rice has been in the fridge for at least half a day, heat up your frying pan and remove the lidded bowl. Apply enough butter to the pan to coat it as it melts. If using cooking oil, just apply enough to lightly coat the pan. Once the pan has reached a sufficient level of heat, as indicated by the sizzling butter, or by dropping a fleck of water onto the oil from a safe distance away and hearing it pop, remove your rice from the bowl and add it to the hot pan. Stir the mixture around for 90 seconds, long enough for everything to visibly show that it has been covered in oil. Add your favored barbecue sauce while stirring the mixture. Continue to stir the mixture until everything reaches a uniform coloration. Immediately transfer the rice to your serving vessel. Either bring the serving vessel to the table or dispense individual portions of your barbecue fried rice on the same plate bearing that person’s allotment of chicken nuggets. So there you have it, a hearty handful of side suggestions to serve with chicken nuggets. When you want to have the best possible meal that involves chicken nuggets, you really need something to add more flavor and contrast to the meal. Pick one or even two, if you are having a proper feast, side dishes on this list. Prepare those side dishes and also your nuggets. Serve the nutritional bounty with a smile on your face. Sit down and enjoy your meal with whoever else you are feeding.